How do you make a cake lift equally and minimize doming? Some time ago, I baked a cake (Sachertorte to be exact). The taste and texture was fine, so my recipe is okay. Anyone knows the cause of my problem, or even better a solution? I think I put enough butter on the side of my springform pan, in case this is an option. leavening agent creates bubbles, causing the soft dough to rise. For chemically leavened doughs (baking powder or baking soda), the amount of lift mostly depends on the time the bubble creating reaction goes on and the concentration of non-spent leavening agent. The gluten in the dough sets, building a sturdy 3-d mesh of long, branchey molecules. When the mesh is strong enough, further bubbles cannot stretch it more, despite the fact that the leavening reaction is still going on. The setting of the mesh depends mostly on heat and the amount of gluten present in flour. The pattern you are seeing means that your cake gets hotter on the sides than in the middle. The sides get set early and stop rising, while the middle is still soft and continues rising. This happens because the walls of the pan conduct heat to the sides of the cake quicker than heat is conducted inside the cake. 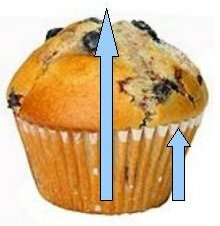 You see the phenomenon in an exaggarated form in a muffin, which is usually higher than wide: it is always rounded on top, and often split, because the liquid core from the middle continues to rise after a crust has formed on the surface. One good solution could involve a slower, more even heating method. This can be accomplished by using a pan which insulates well. With an insulating pan, the sides will stay liquid longer and rise more. Unfortunately there are no insulated drop-out-bottom pans. I have had good results in a porcelain or Pyrex pan. The pan insulates the cake from the bottom and the sides, but not from the top, so you will need to bake it on a lower rack and/or reduce temperature on the upper heater in order to not burn the upper surface. Getting a cake layer out of the pan in one piece can be hard. To deal with this problem, if your batter is not too sticky, the bottom of the pan can be lined with parchment paper. The sides can be lined with a strip of parchment or well lubricated with fat. This approach is a hassle. Perhaps, when combined with other approaches, a metal cake pan with thicker walls will work well enough. You could also try a more DIY solution, like attaching 2-3 layers of a cut-to-fit silicone rolling mat stripes to the outside of the walls of a metal pan. However, it is quite hard to come up with a good attachment method (glue could release toxic fumes at oven temperatures, if it holds at all). So this method should work, but is somewhat hard to apply. There are pans with glass bottoms and silicone walls but I think these would not help because the glass would insulate better than the thin silicone. Perhaps preheating the detached bottom of a metal pan with the oven could help, but I haven't tried it. A second approach is to minimize the liquid core by making a thin cake. If the middle of the cake is heated quickly enough from above and below, it will set shortly after the walls do, and there will be no unset center to "bloom". I think that Americans mostly use 9 inch pans, but if you used an original sacher recipe from Austria, it is probably meant for a 26 or a 28 cm pan. Divide the batter into two pans instead of making a single layer and cutting it. This is unorthodox, as you get more crust but it's better than a hunchbacked sacher. You should use a scale or at least a measuring jug to divide the batter, or you'll end up with different thicknesses. Also remember to reduce the baking time, as the core will heat up faster. Use a toothpick for probing doneness. The third idea is to reduce the amount of leavening agent. The walls will always set before the core and, if there is enough baking powder, the core will still expand a little bit more. If the concentration of baking powder is low you'll get less bubbles, so less lift. Of course, using too little baking powder will also ruin the cake, so you'll have to be cautious and experiment a bit before hitting the correct amount. The fourth approach is to give the outer portions of the cake more time to rise by baking at lower heat. This is somewhat risky, as it can result in a different texture of the final product, due to the different rate at which water will evaporate from the dough and a longer baking time. Also, if your temperature is too low, you won't get a golden crust on a light-coloured dough. This should not be a problem for a frosted cake like the sacher. The fifth approach is to use a flour with less gluten. With less gluten you get a mesh which is less dense and needs more time until it gets firm enough to prevent rising. Use cake flour instead of all purpose flour. A bit more fat will also help to inhibit gluten development but too much will change the taste and texture. All methods I described should attribute to a solution, but probably none of them will be sufficient by itself. You'll have to pick a combination of them and see what works best for you. Not following these techniques is more likely to result in a lopsided cake or a big bubble. I realize that this hasn't happened in the case you describe, but it would be too bad to get an asymmetrically risen cake after you took all the precautions against a disproportionally rising center. I have never baked a cake that hasn't risen more in the middle than around the sides. Nor, I am almost certain, has anyone else. Guess how pros get their cakes flat; they cut the top off! To be precise, they cut the top off (generally not totally flat though), then they turn the cake over so the nice flat bottom becomes the top. Then they ice (frost) it. The problem is just uneven rising because of when the different parts of the cake cook. The solution is to insulate your cake pan. You can wrap your cake pan in a damp tea towel (reserve one or two just for this purpose) or there are special insulated strips that are sold specifically for this by baking supply stores. Basically it insulates the outside part of the cake and the whole thing rises more evenly. You might also want to tap your pan to distribute batter evenly and remove air bubbles before putting it in the oven, but this on its own is unlikely to get a flat cake. Use towel strips! http://judyscakes.blogspot.com/2011/01/making-cakes-rise-evenly.html I cut mine to fit around the pan evenly and pin together. I've read somewhere that if it's domed slightly, once you take the cake out of the oven, straight away push the dome down ever so gently with a kitchen towel. This will release any air that's built up in the dome. It works if the dome isn't very high. my cookery teacher always told me to scoop out a hollow in the centre and spread it to the edges. That way the centre is playing catch up. If you still have a dome you can compensate with icing/ slice the top off or turn the cake over. The latter works especially well for a fruit cake that will be fully iced. Turn over and fill gaps at bottom with marzipan before covering the whole cake. I stumbled across this page about uneven baking of cakes. I bake about 2-3 cakes for special occasions each week. Doming can be a real issue so to ensure an even bake I use bake even strips. I attach an Amazon link where I purchased mine from but I am sure you can find them elsewhere. 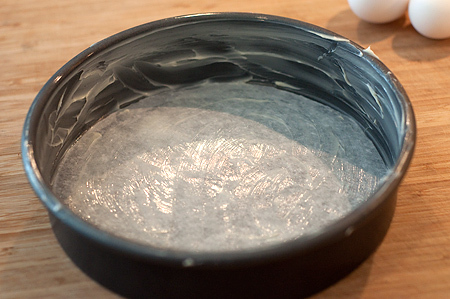 I bake 6, 8, 9, 10 and 14" cakes in aluminum pans 2" deep which I line with paper and a cake release oil. I use a rule that any sponge should be no more than 2" deep to allow the outside to cook in time with the middle. Any deeper cakes can result in an over bake on the edge to ensure a bake in the center. If there is a small dome in the middle of the cake I would always slice this off to give a flat top but I have found this to be minimal. The bands are soaked in tap eater prior to use (do this while making the cake batter), gently squeeze excess water and the wrap around the tin. I bake sponge cakes at no more that 150C (300F or Gas mark 2) on a low shelf. So basically a slow low temp cook but check you oven temp as they vary so much! Before cake is completely cooled, invert 1 of the layers. This becomes the bottom layer of your cake. Ice as you like then add second layer but DO NOT INVERT. This gives you the attractive slight doming effect without the cake breaking or cracking. I have done this for years without a problem. Hope it works as well for you as it does for me. Not the answer you're looking for? Browse other questions tagged baking cake or ask your own question. How to keep the surface of the cake from splitting? How do you minimize cake doming? Why does my cake rise more in the center? How to trim a cake so it's level? Correct way to join two halves of sponge cake? Will newspaper covering a cake pan catch fire in the oven? What temperature and time should I use for a cupcake recipe? How much can I change the height of a cake? How should I alter a chocolate cake recipe to make plain/flavoured cake? Why didn't my beer cake cook properly? How do you convert a cake recipe to make brownies? How do you make a cake with soft fillings baked inside? Tapioca pizza crust is undercooked?